SPACES FOR CHANGE | S4C believes that the knowledge of human rights and dignity for all is the foundation for community empowerment. 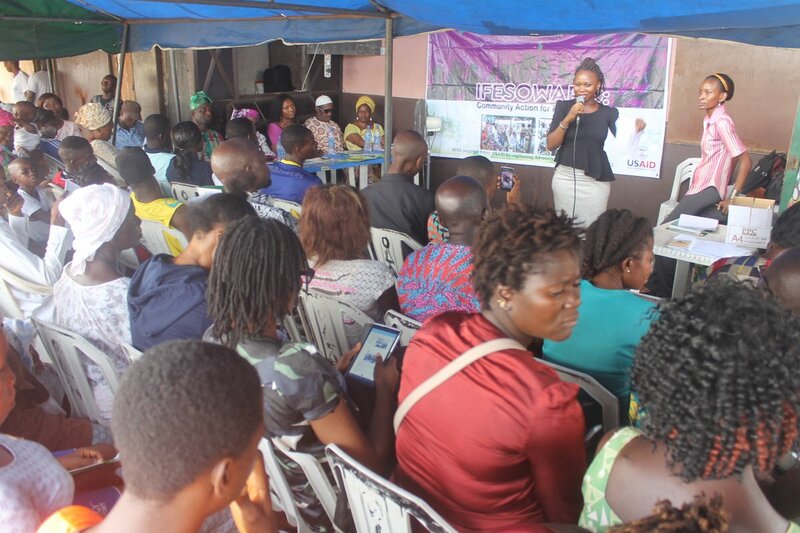 This belief informed the community outreach in Badia on 23 May, 2017, aimed at educating the residents about their economic, social and cultural rights protected under various local, regional and international instruments This outreach, supported by USAID-SACE forms part of a series of activities under the IFESOWAPO project that seeks to educate the community members about policy provisions, legal rules and governing principles they can use to challenge forced evictions, demand better delivery of public services and take problems with delays or denial of benefits and services directly to responsible public institutions. Badia has had a long history of demolitions. In 2013, the Lagos State Government demolished parts of Badia, displacing over 9,000 people in a bid to make way for a housing project built under the Home Ownership Mortgage Scheme (HOMS). The victims of the 2013 demolition exercise have not been rehoused or adequately compensated till this day, fueling serious concern that the Lagos State Government will use the land now being cleared to expand its HOMS housing scheme. Again, in 2015, hundreds of families in Badia, rendered homeless at the peak of torrential rainfall on 18 September 2015 on the orders of the Ojora Chieftaincy Family, and aided by bulldozers operated by officials of the Lagos State Government. The program began with a short drama by children and the youth from Ijora-Badia community. The drama showed the debilitating impact of forced eviction on children’s education, family income and communal cohesion. The drama provided an opportunity for residents to share their true feelings about how forced evictions adversely affects their livelihoods and community wellbeing, while laying a basis for understanding the range of human rights issues implicated. After the drama, S4C’s Aizighode Obinyan and Joan Ohwaguono facilitated the sensitization program, titled, Understanding Economic, Social and Cultural Rights (ESC)’. Participants learnt about the history of human rights and what led to the twofold classification of rights into civil and political rights on one hand, and ESC rights on the other hand. They also learnt about the specific rights classified as ESC rights, as well as the national laws, regional charters and international treaties that provide for them. Of particular importance is the right to adequate housing. Article 16(2) Chapter II of the 1999 Constitution outlines the policy objectives of the Nigerian government on the right to suitable and adequate shelter. Also, Chapter I, Article 14 of the African Charter on Human and Peoples’ Rights guarantees the right to property, and frowns against encroachment except upon in the interest of public need or in the general interest of the community or in accordance with the provisions of appropriate laws. Furthermore, the International Covenant on Economic, Social and Cultural Rights provides specifically on the right to adequate standard of living, including food, clothing and housing. Very importantly, the participants learnt about the differences between ESC rights and civil and political rights. Among several distinguishing features discussed at the program, participants understood that the Nigerian Constitution grouped most of the ESC rights under the Chapter Two of the Constitution, often referred to as the Fundamental Objectives and Directive Principles of State Policy. A clause in the Constitution ousts the justiciability of the rights espoused in that chapter of the Constitution. What this means is that citizens are not allowed to go to court to demand enforcement of their Chapter Two rights when they are violated or denied. On the other hand, the civil and political rights encapsulated in Chapter 4 of the Constitution, do not have any justiciability limitations. In this case, citizens are allowed to use a special procedure to demand speedy enforcement of those rights whenever they are denied or violated. Through legal literacy and capacity building interventions like the above, community members understand how the state’s urban policies and programs lead to forced evictions and violate their rights under national, regional and international instruments. Mrs. Hadjara Shikbau, Strengthening Advocacy and Civic Engagement (SACE)’s representative bemoaned the deplorable living conditions in the community and implored them to fulfill their civic duties. The fulfilment of their civic duties will not only empower them to speak up against marginalization and human rights violations, but will also enable them to change the leaders that do not represent their interests well. She commended SPACES FOR CHANGE for organizing the outreach, and charged them to take the message of empowerment to more disadvantaged communities across the country.